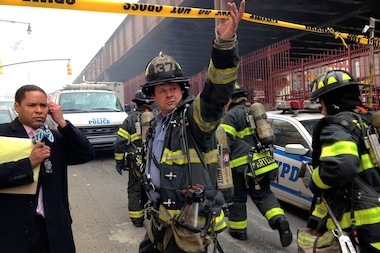 First responders swarmed 1646 Park Ave. near East 116th Street after an explosion there about 9:30 a.m. March 12, 2014. MANHATTAN — The city and a host of relief agencies have scrambled to provide assistance and information to those affected by the East Harlem blast that leveled two buildings and provide information to loved ones looking for the missing and the dead. ► Neighbors were advised to stay indoors and avoid the smoky air. Those concerned about air quality can get safety tips from the Department of Health's Twitter feed and check the website. ► Those who were affected by the explosion can visit the Salvation Army at 175 W. 125th St., near Adam Clayton Powell Boulevard, for information and services. The center will stay open until 9 p.m. Thursday and reopen Friday at 8 a.m., according to the Office of Emergency Management. ► The Salvation Army is also housing a shelter where displaced residents can stay temporarily. Residents can register there for longer-term emergency housing in the area, the Red Cross said. ► Those looking for care and supplies can also find it at the Salvation Army at 175 W. 125th St., officials said.